ثابت, فرحناز, بندگانی, مجتبی, صادقی, مهربان, حاتمی منش, مسعود, میرزایی, محسن, حق‌شناس, آرش. (1393). ارزیابی حضور فلزات سنگین در نمک و آب دریاچه مهارلو در مقایسه با غلظت آنها در سنگ نمک معادن سیرجان، لار و فیروزآباد. مجله آب و فاضلاب, 26(1), 89-96. 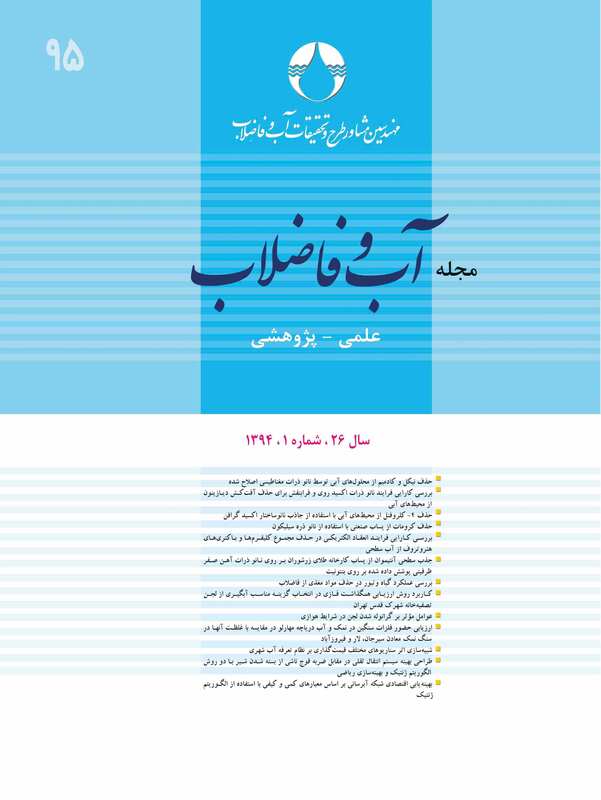 فرحناز ثابت; مجتبی بندگانی; مهربان صادقی; مسعود حاتمی منش; محسن میرزایی; آرش حق‌شناس. "ارزیابی حضور فلزات سنگین در نمک و آب دریاچه مهارلو در مقایسه با غلظت آنها در سنگ نمک معادن سیرجان، لار و فیروزآباد". مجله آب و فاضلاب, 26, 1, 1393, 89-96. ثابت, فرحناز, بندگانی, مجتبی, صادقی, مهربان, حاتمی منش, مسعود, میرزایی, محسن, حق‌شناس, آرش. (1393). 'ارزیابی حضور فلزات سنگین در نمک و آب دریاچه مهارلو در مقایسه با غلظت آنها در سنگ نمک معادن سیرجان، لار و فیروزآباد', مجله آب و فاضلاب, 26(1), pp. 89-96. ثابت, فرحناز, بندگانی, مجتبی, صادقی, مهربان, حاتمی منش, مسعود, میرزایی, محسن, حق‌شناس, آرش. ارزیابی حضور فلزات سنگین در نمک و آب دریاچه مهارلو در مقایسه با غلظت آنها در سنگ نمک معادن سیرجان، لار و فیروزآباد. مجله آب و فاضلاب, 1393; 26(1): 89-96. دریاچه مهارلو از مهم‌ترین اکوسیستم‌های آبی ایران است که در معرض خطرات ناشی از مدیریت آب، برداشت نمک و آلودگی‌های شدید، به‌ویژه فلزات سنگین قرار دارد. در این پژوهش غلظت کروم، مس، آرسنیک، کادمیم و سرب در نمک و آب مناطق شمالی و جنوبی دریاچه مهارلو ارزیابی شد. پس از هضم نمونه‌های برداشت شده از هر بخش، میزان فلزات سنگین توسط دستگاه جذب اتمی اندازه‌گیری شد. بر اساس میانگین مقادیر اندازه‌گیری شده، ترتیب فلزات در نمونه‌های نمک در شمال و جنوب دریاچه مشابه و به‌صورت Cr> Cu> As> Cd> Pb بود. در نمونه‌های آب، ترتیب مقادیر فلزات در هر دو بخش یکسان (Cr > Cu > As > Pb > Cd) بود. نتایج نشان داد غلظت فلزات موجود در نمک و آب، به‌جز فلز سرب، در بخش شمالی دریاچه نسبت به بخش جنوبی آن بیشتر است. همچنین مقایسه میانگین غلظت فلزات مورد بررسی در نمک دریاچه با سنگ نمک معادن سیرجان، لار و فیروزآباد نشان داد که بیشترین غلظت فلزات مس، کادمیم و سرب در نمک دریاچه و برای آرسنیک و کروم به‌ترتیب در سنگ نمک لار و فیروزآباد وجود دارد. به‌طور خلاصه می‌توان نتیجه گرفت که تغییرات غلظت فلزات در دو بخش شمالی و جنوبی دریاچه ناشی از ورود فاضلاب‌ها و پساب‌های مختلف شهری، صنعتی و بیمارستانی شهر شیراز و سایر فعالیت‌های انسانی به‌ویژه فعالیت‌های کشاورزی در حوزه‌های منتهی به بخش شمالی دریاچه است و اقداماتی برای پیشگیری در منطقه، بیش از پیش لازم است. Maharloo Lake is one of the most important water ecosystems in Iran, which is nowadays exposed to multiple risks and threats due to poor water management, salt extraction, and heavy metal pollution. In this study, the concentrations of such heavy metals as chromium, copper, zinc, arsenic, cadmium, and lead in both water and salt samples collected from areas in the north and south of the lake were determined by atomic absorption (AA-670G) after the samples had been digested. Results showed that metal concentrations in the salt samples taken from both the northern and southern areas had identical mean values in the order of Cr> Cu> As> Cd> Pb. An almost similar pattern was detected in metal concentrations in water samples taken from the same areas but with a slight difference in the way they were ordered (Cr> Cu> As> Pb> Cd). It was found that both water and salt samples collected from the northern areas had higher metal concentrations, except for that of Pb which was slightly lower. Comparison of the mean values of metal concentrations in the Salt Lake and those of Sirjan, Lar, and Firoozabad salt mines revealed that copper, cadmium, and lead had their highest concentrations in the Salt Lake while arsenic and chromium recorded their highest values in samples taken from Lar and Firoozabad salt mines, respectively. Based on these findings, it may be concluded that the increased metal concentrations observed in samples from both northern and southern areas of the lake are due to the sewage and effluents from urban, industrial, and hospital sources in Shiraz disposed into the lake as well as such other human activities as farming in the areas around the lake, especially in the northern stretches. These observations call for preventive measures to avoid further water quality degradation in the area. Lamanso, C.Y., and Chan, R. K. (1991). “Metal concentration in the tissue of rabbitfish collected from Tolo Harbour in Hong Kong.” J. of Marine Pollution Bulletin, 39(1), 123-134. Stewart, A. (1999). “Accumulation of Cd by a freshwater mussel (Pyganodon grandis) is reduced in the presence of Cu, Zn, Pb, and Ni.” Canadian J. of Fisheries and Aquatic Sciences, 56(3), 467-478. Islam, E.U., Yang, X., and Mahmood, Q. (2007). “Assessing potential dietary toxicity of heavy metals in selected vegetables and food crops.” J. of Zhejiang University-Science, 8(2), 1-13. Domska, D., and Warechowska, M. (2009). “The Effect of the municipal waste landfill on the heavy metals content in soil.” J. of Contemporary Problems of Management and Environmental Protection, 4(1), 95-105. Khosravi, B.N., and Ghasempouri, M.M. (2011). “Survey of heavy metals (Cd, Pb, Hg, Zn and Cu) contamination in sediment of three sites Anzali Wetland.” Iran. J. of Health and Environ, 4(3), 223-232. Soylak, M., Peker, D.S., and Turkoglu, O. (2008). “Heavy metal contents of refined and unrefined table salts from Turkey, Egypt and Greece.” J. of Environmental Monitoring and Assessment, 143(6), 267-272. Cheraghali, A.M., Kobarfard, F., and Faeizya, N. (2010). “Heavy metals contamination of table salt consumed in Iran.” Iranian J. of Pharmaceutical Research, 9(4), 129-132. Siddique, M.A., and Aktar, M. (2012). “Heavy metals in salt marsh sediments of porteresia bed along the Karnafully River coast, Chittagong.” J. of Soil and Water Res., 7(3), 117-123. 10. Leendertse, P.C., Scholten, M.C., and VanderWal, J.T. (1996). “Fate and effects of nutrients and heavy metals in experimental salt marsh ecosystems.” J. of Environmental Pollution, 94(6), 19-29. 12. Yap, C., Ismail, A., Tan, S., and Omar, H. (2002). “Correlations between speciation of Cd, Cu, Pb and Zn in sediment and their concentrations in total soft tissue of green-lipped mussel Perna viridis from the west coast of Peninsular Malaysia.” J. of Environment International, 28(5), 117-126. 13. Salati, S., and Moore, F. (2010). “Assessment of heavy metal concentration in the Khoshk River water and sediment, Shiraz, Southwest Iran.” J. of Environmental Monitoring and Assessment, 164(8), 677-689. 17. Haritonidis, S., and Malea, P. (1999). “Bioaccumulation of metals by the green alga Ulva rigida from Thermaikos Gulf, Greece.” J. of Environmental Pollution, 104(5), 365-372. 19. Alsagh, A. (2012). “Determination of heavy metals Ni, Cr, Mn and Co in Salt obtained by water treatment and uts comparison with rock salt.” J. of Iranian Food Science and Technology Research, 7(4), 340-336. 20. Forghani, G., Moore, F., Lee, S., and Qishlaqi, A. (2009). “Geochemistry and speciation of metals in sediments of the Maharlu Saline Lake, Shiraz, SW Iran.” J. of Environmental Earth Sciences, 59(1),173-184. 21. Salati, S., and Moore, F. (2010). “Assessment of heavy metal concentration in the Khoshk River water and sediment, Shiraz, Southwest Iran.” J. of Environmental Monitoring and Assessment, 164(1/4), 677-689. 22. Moore, F.G., Forghani, and Qishlaqi, A. (2009). “Assessment of heavy metal contamination in water and surface sediments of the Maharlu Saline Lake, SW Iran.” Iran J. of Sci. Technol., 33(1), 43-55.